While 4K becoming an "easy" thing for consumers since most new smartphones, cameras, TVs, players are making it a standard, 8K is already grabbing headlines when LG revealed its 88-INCH 8K OLED display at CES 2018 together with other manufactures like Samsung, Sony and Panasonic also delivering 8K ultra high - quality TVs. While more pixels mean better quality, 8K workflows are putting an immense strain on computer and storage devices due to the huge data. What are the video formats that can deliver 8K resolutions without taking too much space? 8K resolution is the successor to 4K, also known as 4320P. 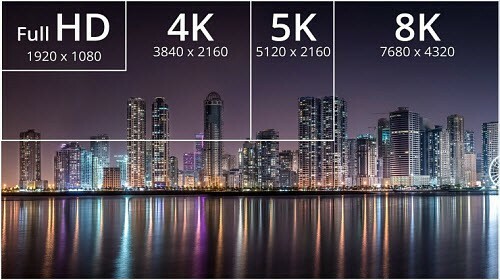 Namely, 8K is 16 times the resolution of 1080P and 4 times of 4K. However, 8K contents are quite limited currently. Fewer cameras have equipped the 8K shooting ability, the most popular 8K cameras including Red Weapon 8K cameras from Red Digital Cinema, together with others like GoPro Omni VR and Insta360 Pro. There are few 8K video samples released: Guardians of the Galaxy Vol. 2 is the first movie shot in 8K at 75fps, and also 8K clips "Ghost Towns," "Peru" and "Patagonia" on YouTube. To watch 8K ultra HD videos, you also need huge screens. To cope with the bigger resolution, new codecs emerge. H.264 used to compress 1080P or 720P videos for streaming online, but the huge jump from full HD to 7680 x 4320 or 33 million pixels require a better way to compress the video. What are the new 8K video formats that can encode 8K ultra HD videos at substantially lower byte sizes? 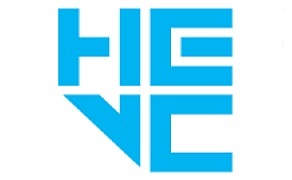 HEVC (High Efficiency Video Coding), also known as H.265, is the successor to MPEG4 AVC/H.264. HEVC offers a much more efficient compression than H.264 by increasing the maximum size of macro blocks from 16x16 to 64x64. It generates 40~50% bit rate reduction over H.264, namely 50% smaller size at the same quality level. Considering that at least 15Mbps is recommended to stream a 4K Netflix movie, 8K asks 50Mbps or higher. HEVC makes it possible to stream, download or store 8K contents within the bandwidth. HEVC H.265 applies larger prediction units, quad-tree based structure of CUs, enhanced coding to deliver a small size. The complicated compression algorithm provides flexible coding design and higher coding performance, while requires 10x more computing power. When you play, edit or stream 8K HEVC format video, it may stutter or get stuck. The solution is to have a capable graphics card and software that supports HEVC hardware processing to load off the 8K HEVC transcoding tasks to GPU. Check how GPU acceleration speeds up HEVC processing. 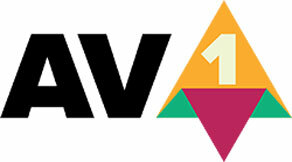 AV1 (also known as AOMedia Video 1) is an open-source, royalty-free video format from the Alliance for Open Media, a group counts big names like Amazon, AMD, Facebook, Google, Intel, Microsoft and Netflix. According to AOM, AV1 achieves gains of 50.3%, 46.2% and 34.0%, compared to x264 main profile, x264 high profile and libvpx-vp9, respectively. It's 30% more efficient than VP9 and 20% than HEVC. Therefore, AV1 was designed to better handle higher resolution videos, being an ideal video codec supporting 8K UHD resolutions. 8k supported codecs require large amount of computing power due to their complicated algorithm to hold 7680x4320 pixels at smaller size. For example, AV1 outperforms VP9 by 17.1% in bit rate savings, which requires a huge amount of increase in computational complexity. And compared with HEVC, AV1 will see 3-5x computing energy for decoding and encoding. Initial demonstrations indicated that 200 virtual CPU cores are required to encode and stream one AV1 video channel. Though the requirements are predicated to drop to 8-32 cores. >> AV1 or HEVC, Which is the Better Codec? HEVC is not a problem because of the support of HEVC hardware support. By offloading the HEVC processing to GPU, the whole process is accelerated without giving too much burden on CPU. On the contrary, there is no GPU acceleration support for the 8K video format AV1, which is encoded and decoded on CPU. In other words, AV1 places high requirements on the hardware level. However, with AMD, Intel and Nvidia all on the list of AOM, AV1 hardware acceleration won't be long (anticipated in 2019). AV1 is quite new. Having Google in the Alliance means the easy adoption of AV1 among Android devices. Netflix, Amazon, BBC also guarantee the anticipated spread of AV1 on the video streaming services. But currently, almost all the newer TVs, cameras, mobiles have HEVC built-in, not AV1. Plus, Apple devices seem to involve around HEVC instead of AV1. If the UHD TVs are incapable of dealing AV1, the 8K video file extension can hardly be adopted widely as 8K UHD resolution requires bigger screen. It is anticipated that the codec will reach any platforms by 2020. VP9 (.webm), the successor to VP8, is an open-source and royalty-free codec from Google for HD/UHD streaming and braodcasting. The biggest improvement of VP9 is the 64x64 maximum block size. Due to the change, libvpx-vp9 can save about 20–50% bitrate compared to libx264 at the same quality, being one of the dominant video codecs for 4320P higher resolution. However, the coding coding efficiency of VP9 is slightly inferior to HEVC (see the detailed differences between VP9 and HEVC). The file extension for 8K UHD is widely used by major web browsers except Safari, and utilized by YouTube for HD to 4K, 8K videos. Same to the other 8K video formats, VP9 encoding requires longer time, 10-20x slower than encoding x264. Luckily, same with HEVC, 8k VP9 gains some supports on newer GPUs for its encoding & decoding. MacX Video Converter Pro is the best tool to transcode 8K videos without quality loss. Currently, it fully supports HEVC (H.265), VP9 and other modern 8K codecs conversion at up to 5x faster speed than Handbrake and other competitors thanks to Intel/AMD/Nvidia hardware acceleration. 4K vs 8K vs 10K, which resolution will dominate?